Media hounding of Franco-Cameroonian comedian raises questions about 'limitations' on freedom of speech. When the controversial French satirist Dieudonne M'Bala M'Bala was recently asked why his humour was shocking, his answer was: "I find it surprising that some blame me for shocking people. This is my job, a humourist shocks, a humourist bothers." The controversy over Dieudonne may have reached a pitch in French mainstream media earlier this year after his show "Le Mur" (The Wall) was banned by an administrative decision. But an intense debate has been raging for years over the sanctity of freedom of expression and whether or not it should transcend ethnic, religious and cultural consideration. For many of his detractors, the Franco-Cameroonian comedian is viewed as an "anti-semite" and "a danger to society" for what they believe is his "incitement of racial hate". For his fans, Dieudonne is an "anti-establishment" figure, and the campaign to silence him is seen as an attempt to limit free speech. The bigger question, however, in the case of Dieudonne, is whether or not the space for dissent has shrunk in France when a satirist is chided for questioning the country's colonial past, speaking out against establishment or discussing taboo topics such as the Holocaust. Dieudonne won a strong following back in 2003 while performing a controversial sketch on public television channel France 3, caricaturing an extremist Jewish settler calling to join "the axis of good" (as opposed to the infamous term "axis of evil"). He ended his sketch with the word "IsraHeil". Soon after, Dieudonne was accused of being an anti-Semite and was ostracised from the media landscape. Meanwhile, a public debate was initiated on the limits of freedom of expression and whether or not issues deemed sensitive by French elite standards could be discussed or criticised. After some ups and downs, Dieudonne grew to be more explicit about his political views and presented himself as "anti-Zionist" and "anti-establishment". This, however, was not without a price. He was physically attacked and some of his shows were interrupted by protests organised by Jewish organisations such as the UEJF (Union des Etudiants Juifs de France). Towards the end of 2007, the Paris Court of Appeal sentenced Dieudonne for "anti-semitic" remarks after he described Jews as "slave traders" (Negriers) in an interview with Journal-Du-Dimanche newspaper in February 2004. Despite his controversial stands, Dieudonne maintains a notable following of a very heterogeneous composition, as once described by the French weekly magazine Le Point: "Young shaved headed, North Africans, young preppy girls or 'soixante-huitards' [referring to 1968 French social protest movement] and even some 'Bonnet Rouges'... Dieudonne's fans form a cohesive mosaic united by their rejection of elites." Dieudonne has also repeatedly made references in his shows to what he describes as the special treatment reserved in French media to the Jewish victims of the Holocaust during World War II, and how the popular concept of "crime against humanity" does not seem to recognise other peoples' suffering, such as the black victims of slavery or the indigenous populations of the Americas. Stretching this a bit further, he hosted on stage the controversial historian Robert Faurisson (politically classified as revisionist). Such a move hardened the critics' position and fresh accusations of anti-semitism were levelled against him. The situation was further complicated when Dieudonne initiated a gesture called "la quenelle" (which is a flattened hand pointed in direction of the ground) presenting it as an anti-establishment symbol, but organisations such as the Conseil Represntatif des Institutions Juives de France (CRIF) claimed it was an "inverted Nazi salute". The tense debate reached a climax earlier this year when in January 2014, the Council of State, the highest administrative court in France, banned Dieudonne's show "Le Mur" after a request was submitted by the then Interior Minister Manuel Valls. Today, that same elite is attacking Dieudonne for the exact same values it claimed to be defending during the Charlie Hebdo affair. 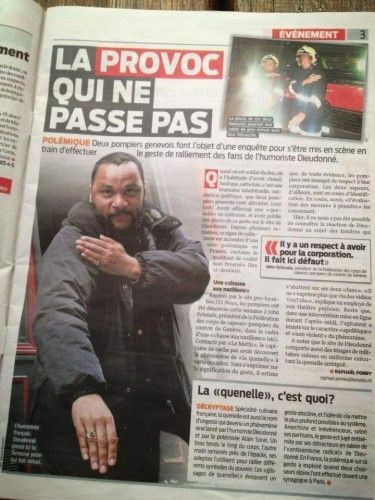 Valls pledged to "set limits" to Dieudonne by banning his shows. The interior minister's initiative received President Francois Hollande's full support. An opinion poll issued in January 2014 showed that only 38 percent among French population support the principle of banning Dieudonne's shows, while during that same period a drop by 7 points occured in Manuel Valls's popularity (from 60percent to 53 percent). Meanwhile, momentum was gaining ground on social media outlets in support of Dieudonne against the establishment. Public figures expressed their support to the humourist such as the jazz musician Gilad Atzmon and the writer Jacob Cohen who aired a youtube interview where he was seen performing the "quenelle" gesture in support of the comedian. Dieudonne's youtube videos, in which he periodically comments on current events, are watched by millions of viewers. Eight years ago, the French satirical weekly magazine Charlie Hebdo, in a gesture of solidarity with the Danish newspaper Jyllands-Posten, decided to republish the offensive cartoons of Prophet Mohammad, in defiance of the French Muslim community's indignation and protests. The magazine then received unanimous support from the French establishment, mainstream media and intellectual elite from across the spectrum expressing solidarity with the magazine on behalf of the sacred right to freedom of expression. Today, that same elite is attacking Dieudonne for the exact same values it claimed to be defending during the Charlie Hebdo affair. But they fail to realise that while a political humourist might want to prove an ideological point through satire, that form of entertainment remains among the most effective tools to engage an apathetic public and to address issues that are deemed sensitive. That said, the question then is not so much about whether we approve or disapprove of Dieudonne's discourse, rather it is how France can remain faithful to its own principles of "freedom, equality and fraternity" when in one case, the republic and its intellectual elite stand in unison to defend freedom of expression, while in Dieudonne's case, they appear more willing to compromise that freedom - perhaps even to redefine its contours.